Flight testing of an An-74 develop-ment of the An-72 Coaler twin-turbofan Stol transport was announced early in February 1984. The An-74 has been developed specifically for use in the Arctic and Antarctic, and may be equipped with an interchangeable landing gear, with skis available for operations from ice and snow. 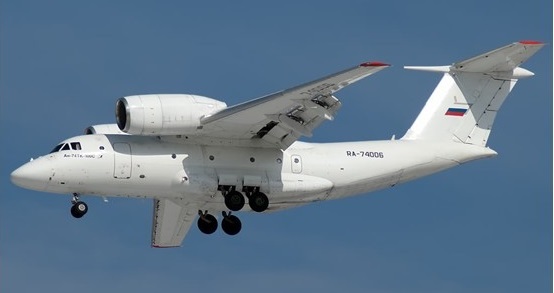 Principal differences apparent in the An-74 are a longer fuselage with a nose-mounted radar, and a redesigned wing. First flown in 1977, the An-72, and the related An-74, only received its airworthiness certificate when the An-74TK was certified by Aeronautical Register on 2 August 1991. The An-74 was also produced at Kharkov from December 1989. 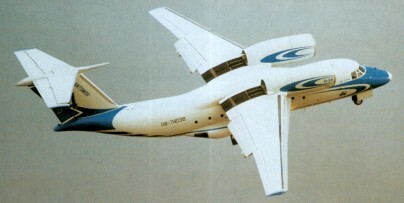 Production of An-74 also started by Polyot Industrial Association at Omsk, Russia, in 1993 (assisted by Progress at Arsenyev); first Polyot aircraft (RA-74050) was flown 25 December 1993. A An-72P maritime patrol version was demonstrated 1992 and development of the An-74-200 and An-74TK-200 by Antonov started 1995. The An-74TK-300 is basically an An-74TK-200 with underslung engines. The An-88 is a tactical battlefield surveillance aircraft based on An-72 (also known as An-72R). Engine: 2 x Lotarev D-36 turbofan. Range/payload: 3300 km with 5000 kg. Engines: 2 x Lotarev D-436.